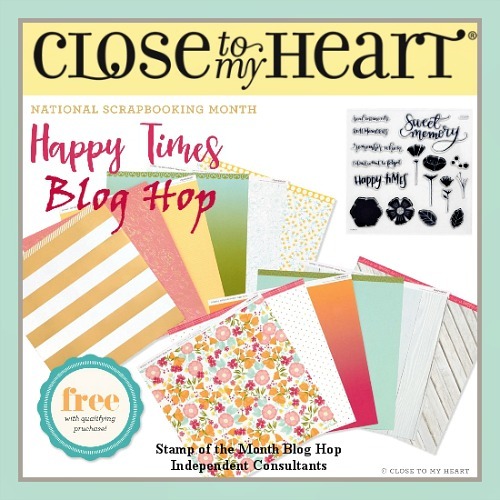 May is National Scrapbooking Month and Close To My Heart is celebrating Happy Times! That's right - It's a paper pack full of happy colors and prints! You will love this gorgeous pack of 14 papers (2 each of 7 designs). We also have a Happy Times stamp set that coordinates beautifully with the paper. 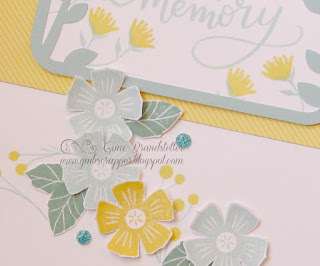 Today's blog hop features artwork created with this paper and stamp. If you arrived here from Pricilla's blog you are on the right track! If you are just getting started, don't worry, the hop is a big circle so when you get back to me, you have visited all the blogs! If you get lost along the way, you can see the entire list of hoppers HERE. I chose to showcase these lighter papers because they give me the feeling of spring and newness. I think this layout would be great for showing new baby pictures! I added glacier cardstock for my photo mats. I used the Artfully Sent cricut cartridge to cut a pocket card for my title which has "sweet memory" stamped in Glacier. I also randomly stamped the little flower and stems in Canary and Glacier inks. I added little white bows to the top of three of the photos.These were cut with the Artiste Cricut cartridge. To finish off the page I stamped several flowers and leaves to cluster around the page. The flowers are stamped in Glacier and Canary and the leaves were stamped in Juniper ink. I used the blue glitter gems from the Enamel & Glitter Duos Blue Dots around the page and added one to each white bow. Add your Happy Times Paper and Stamp HERE! Now it is time to hop over to Lela's Blog and see what she has created! Beautiful layout. I like your colors choices. The layout is elegant. Gorgeous layout - all the little details bring everything together so perfectly. Obviously carefully planned out and it looks stunning! Such a sweet layouts with yellow and grey. Love them! Very pretty! I am loving all the different looks from Happy Times! Wow this is beautiful, and I love the little bows! Beautiful layout using the yellow paper that I struggled with! Love the Glacier card stock with this paper pack. Nice use of a pocket card for a title frame. Very pretty layout ~ so spring like. Georgie Paper - Not Just for Babies! Shakin' it up with Calypso! New Seasonal Expressions 2 is Here! 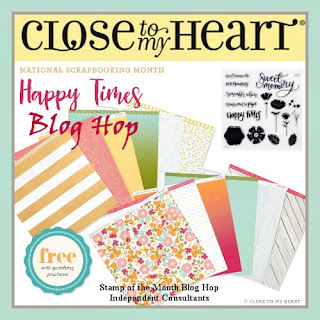 May is a Great Month for Scrapbookers!